Visit 3 craft breweries in 3.5 hours! Enjoy lots of their beers and learn about them and the local scene with up to 12 new drinking buddies. Between breweries, flash back to the hippie Summer of Love in 1967 and enjoy sights and stories of the neighborhood. This Haight-Ashbury beer crawl has everything a beer lover could want from an afternoon in San Francisco. Half tour, half celebration, there is a focus on craft beer education and bringing the 1967 Summer of Love to life as you enjoy many generous samples of unique locally made beer. The beer and light snacks are included in the price of your tour! Experience 3 microbreweries and/or craft beer bars in a way you couldn't on your own. Learn the unique contribution each destination makes to the scene and the backstory of each beer you consume. As often as possible brewery staff will tell you first-hand stories and add a special personal touch to the tour. While you walk from one brewery to the next, your enthusiastic guide will briefly, but vividly, describe the iconic role of the Haight-Ashbury neighborhood in the hippie movement. Imagine yourself at the Summer of Love as we visit important Haight St. monuments and bring the hippie scene to life. As time passes and beer flows, friendships are made and informative sessions transition into a more festive atmosphere, but your guide will never stop educating those who want to hear more. By the end of the tour you should be full of smiles and new knowledge, as well as enough beer that you can't drive home, but you could still walk home. 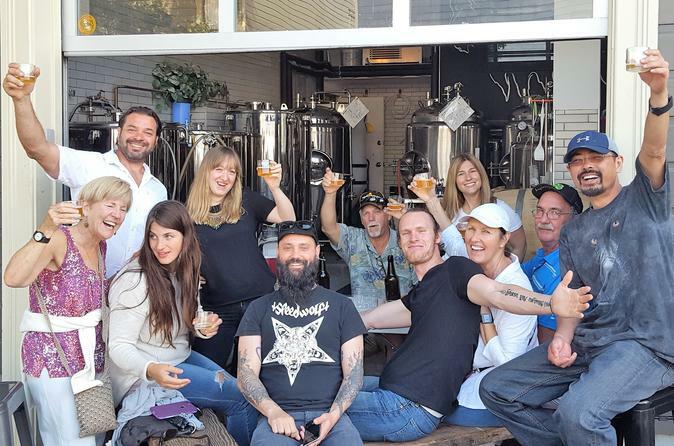 In San Francisco there is always another great bar nearby and each tour ends with the opportunity to join your new beer-loving friends for another pint, a bite to eat, and more good times. Whether or not you're able to stick around for that, your guide will be happy to help you find a way home, or recommend other excellent activities in the area.